Any of our 3D filters, including our exclusive lines of ChromaDepth®, HoloSpex®, and IYF 3D filters can be incorporated into dozens of different styles of hand-held glasses and viewers. Our 3D Handheld glasses and viewers are also an effective way to cut costs and labor when the viewers are used for insertion into envelopes for direct mail campaigns. Our hand-held viewers are easy to polybag automatically and are the perfect size for use for children's premium items as well as for tipping into magazines and books. 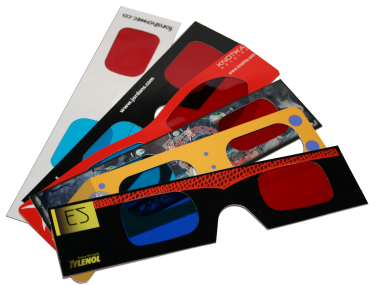 Any of our 3D handheld glasses and viewers can be customized and custom printed to maximize the advertising effect of your 3D promotion, magazine, or website! We always keep a large inventory of plain white 3D handheld glasses and viewers with all of our different optics in stock for fast, immediate shipment. Of course, any of our 3D handheld glasses and viewers can be customized and custom printed to maximize the advertising effect of your 3D promotion, magazine, or website.